Deck the halls with a difference - we show you how to use up any left over apples to create a stunning Christmas apple tree decoration. This is a great alternative to traditional Christmas decorations. Use up surplus apple harvests or buy a few bags from the supermarket. Take a walk and see what berries you can find to add to the display. Treat yourself to a floristry foam cone or create your own shape from polystyrene, and get creative. The display should last for 2-3 weeks if kept in a cold room, maybe longer if held in a cold shed or garage until you are ready to bring it indoors. 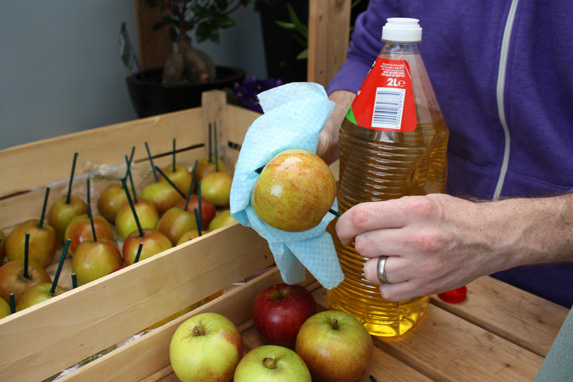 1) To reduce the risk of your apples and berries turning bad, or bringing pests into the house, first wash and dry your collected materials. 2) Cut pea sticks into sections and insert one piece into the base of each apple. 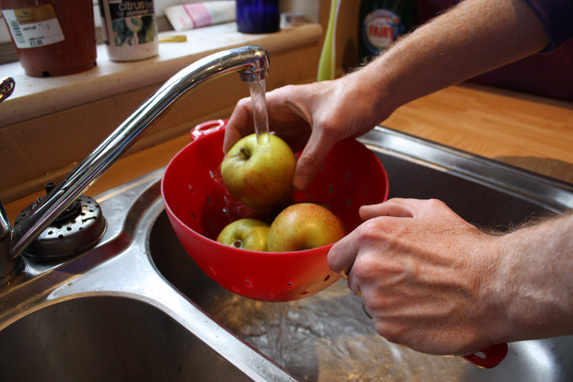 For a decorative and shiny finish, wipe each apple with vegetable oil. 3) Working from the bottom, start to attach the apples to the cone by inserting the pea sticks into the foam, leaving gaps for berries. 4) You can add berries once all apples have been placed, as I‘ve done, but in hindsight I think it would be easier to add them as the apples are placed. 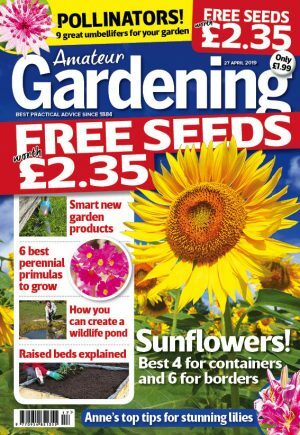 5) Once your cone is covered, stand it on a decorative base, raising it a few inches by first placing an upturned pot saucer on the base centre. 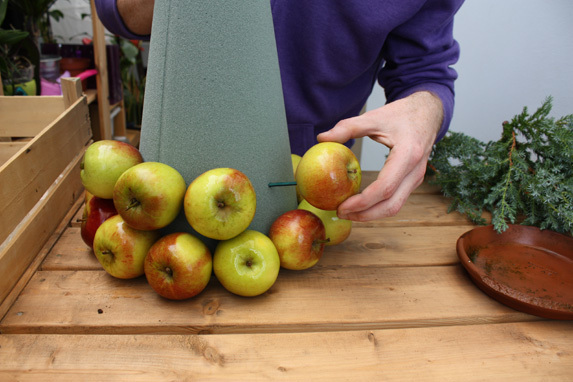 6) To finish the look, add mixed evergreen foliage around the base of the cone, and if you have some spare, sit a few more apples on top of this.